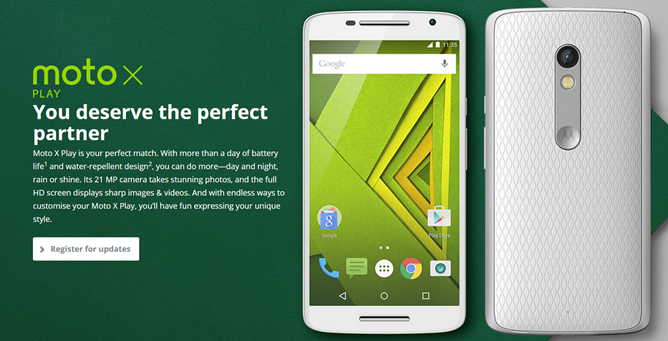 The Moto X Style isn't the only new flagship that Motorola revealed at its press conference this morning. The new Moto X Play is basically a "Maxx" version of the phone, with a smaller 1080p screen, but a gigantic 3630mAh battery (plus Turbo charging) for what Motorola calls "48 hours of mixed use." The price will reflect the slightly lower specs, since Motorola claims that this phone will be "$300-400 cheaper" than flagship phones from the competition. That will get you a 5.5-inch screen (bigger than the 2014 Moto X, slightly smaller than the Moto X Style), an impressive 21MP camera (5MP front-facing), 16 or 32GB of storage depending on model plus a MicroSD card slot, and a Snapdragon 615 processor with 2GB or RAM. The body is smaller and thicker than the Moto X Style thanks to the smaller screen and bigger battery, but the rear plastic is textured and the sides and horizontal accent are metal. It gets the same water resistance as the rest of Motorola's current line. While the Moto X Play will get access to Moto Maker, it's not currently known whether or not the Play will have access to more exotic materials like leather or wood, or whether those are reserved for the Style. Software is Android 5.1.1 at launch. The price isn't known yet, but the Moto X Style has been confirmed with a starting price of $399, so presumably the Moto X Play will be $50-100 less (in local currency). 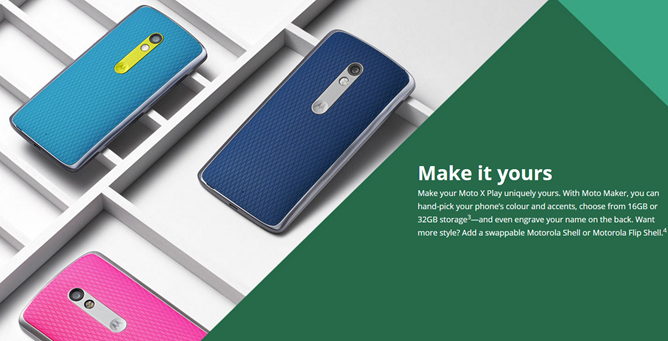 Motorola may or may not expand the device to the US market at a later date. 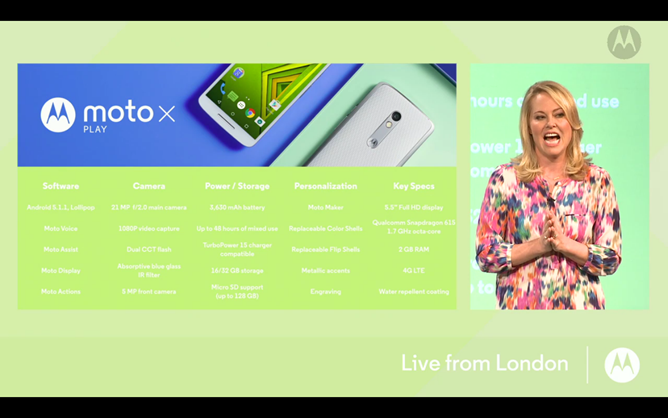 The Moto X Play's release, for whichever markets do get the phone, is scheduled for August. This Motorola blog post has more details about the Moto X Play's availability, and confirms that there will be no US release. Moto X Play will be available starting in August in various countries across Europe, Latin America, and Canada (sorry, it won’t be available in the US, but we’ll have more choices for you all later this year). I'm betting (read: speculating) that "more choices" probably means "Verizon-exclusive DROID models."